A moist, rich sugar-free Keto Mug Cake recipe that’s ready in under 5 minutes. 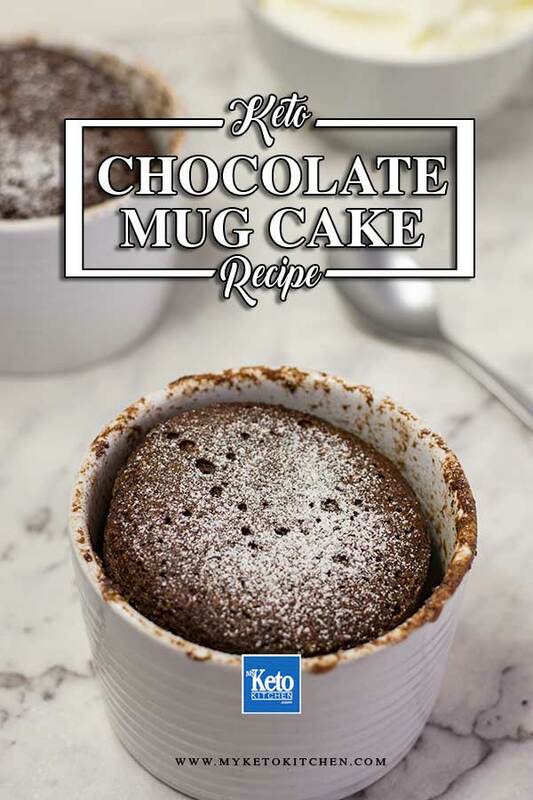 This delicious chocolate mug cake is very low-carb and the result will amaze you considering how it’s made! While the ingredients list looks a little longer than most low-carb mug cakes, these ingredients all play their part in avoiding a rubbery, eggy cake. 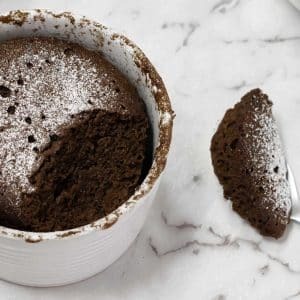 This keto mug cake is moist, light and rich with no overbearing egg taste. 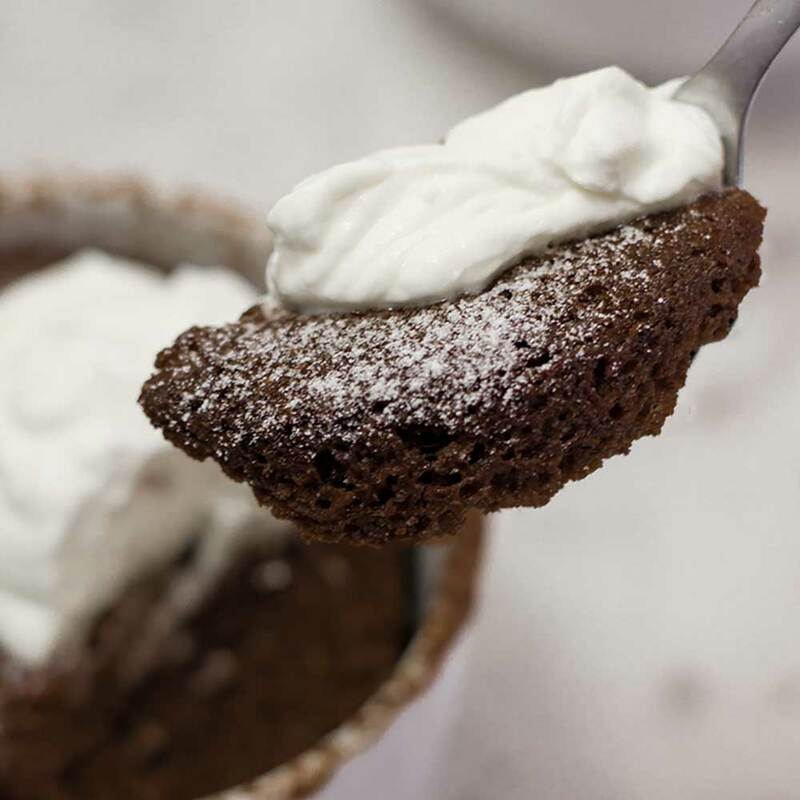 This mug cake can be served as is, but we recommend topping it with a little Keto Whipped Cream for added fat and deliciousness. Or for a decadent “death by chocolate” experience, top the warm cake with our Keto Chocolate Ice Cream. This chocolate mug cake recipe makes 1 serving. Mug Cakes can be refrigerated for up to 3 days, though they are best eaten freshly cooked. All of these are common ingredients that all budding Keto cooks should have on hand not just for mug cakes but for a bunch of our other low-carb dessert recipes. In a small bowl mix together the dry ingredients. Pour the cake mixture into a mug or ramekin. Microwave the batter for 1.5-2 minutes until the cake is cooked through. Allow to cool for a couple minutes before enjoying topped with some Keto Whipped Cream. These Keto Mug Cakes can are easy to make quickly when unexpected visitor arrive as you don’t have to bake them like, you’d don’t have to tell them they’re low-carb. Keto Mug Cake - Rich Chocolate Recipe - Quick & Delicious! "Keto Chocolate Recipe"
A moist, rich sugar-free cake that’s ready in under 5 minutes. We’re talking about our Keto Chocolate Mug Cake! Low-Carb Chocolate Mug Cake – Keto friendly and Gluten Free! To make more Keto Chocolate Mug Cakes adjust the servings above.